La Grange Cup is Coming! Greetings La Grangers. I hope everyone’s having a great 2018 so far. Moving further into Spring and away from any potential rain means one thing; it’s time for the 2018 La Grange Cup to get underway! The La Grange Cup 500M Sprint will take place on Sunday, June 3rd from noon to three at the World Famous Encino Velodrome. You don’t need a track bike for this event, just a desire to go flat out from a standing start for two laps. More details will follow so for now, put this on your calendar! Castelli Spring Order Is On Its Way! If you ordered goodies in our recent Spring kit order, it will be on its way soon! You should receive the magic UPS notification from Castelli any day now. Putting on races in So Cal is hard. Expenses are high and racer turnout can be low. We have all seen some of our favorite races disappear (Boulevard or Vlees Huis, anyone?). It was brought to our attention that another race was in danger of disappearing: the Junior State Road Championship. This is the race that gives the juniors a shot at a coveted Bear jersey as State Road Champion. This race was gone…until a committed and industrious promoter stepped in. Alfie Sanchez and Majestic Cycling graciously assumed the financial and time-consuming burden of offering this race. But, they needed help. We are delighted to report that Velo Club La Grange is the proud presenting sponsor of the 2018 SCNCA Junior State Road Championships. This race will bestow the State Road title on junior racers 11-18 years of age. Velo Club La Grange is thrilled to continue its legacy of fostering the next generation of young and up-coming cycling superstars and we thank Alfie Sanchez and all of our members and sponsors for supporting such a worthwhile cause. Katie Rollins - 2018 National Champion! 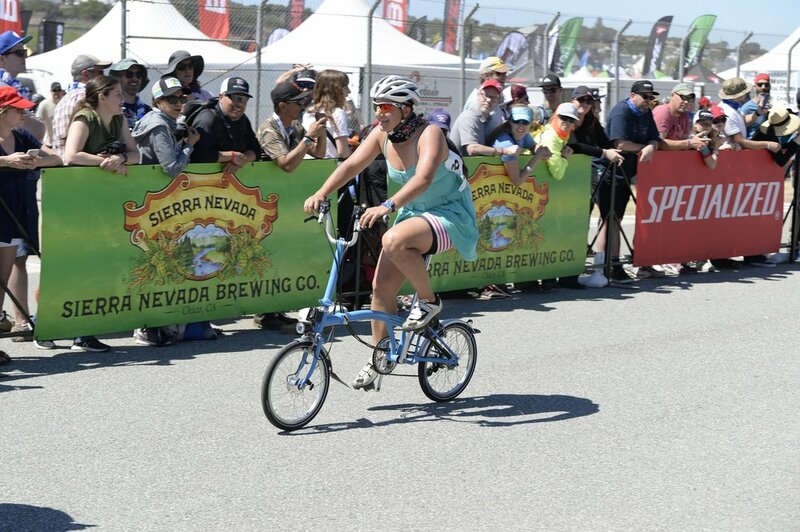 Ever since college I wanted to go to Sea Otter, but this was the first year that I got my priorities straight and made it for the best bike weekend of the year. I took good advice from the brilliant Patrick Barrett and planned Sea Otter to be about playing bikes, not racing bikes. I signed up for the XC mountain bike race, made some carpooling plans and told everyone we were going to take a day trip to the Monterey Bay aquarium. After a day of bike heaven demoing mountain bikes, buying $5 jerseys in expo, and cheering on friends racing, an unfamiliar face wandered through our campsite. Chuck was looking for his friend, but instead he found La Grange. Tina and others of course immediately friended him. He was looking for someone to fill a spot on his team for the Brompton race Saturday afternoon. Without knowing what I was committing to I said "yes." Patrick encouraged me saying - "You're doing Sea Otter right!" Bike: A Brompton that belonged to a stranger. Bromptons are British folding commuter bikes with tiiiiiiiiny wheels. Course: 5 laps around the Laguna Seca raceway (~11mi) with a Le Mans style bike unfolding start. Attire: A Tie, and a coat or skirt -no spandex. Bike knowledge: 30mins in expo to learn to unfold the bike and 1.5hrs before the race to learn how to shift the thing. Course practice: A few laps down the cork screw on my road bike Friday at dusk. Dress code: A scarf tied into a "tie", a sundress intended to be worn to the aquarium, and american flag shorts from Carter's CX heckling outfit. Saturday morning I woke up ready to get the most out of Sea Otter. Seven of us took off for a mountain bike ride and I was feeling sad when I had to turn around early. I tried to maximize my time on the trail with friends and blew a few too many matches rushing back for the race. Sea Otter was about all of the bikes, and I wasn't regretting anything. When I got back to the campsite, I was in mountain bike recovery & race prep mode. I scarfed a burrito and tried to watch a video of a Brompton race to see what I was getting into. I rushed down to the Brompton expo tent to meet up with Chuck. He gave me a bike, taught me how to fold/unfold it and we rode around to get a feel for the small wheels, upright position and 6 speed internal and external shifting situation. I was a little nervous. The 16" wheels made it squirrelly, that cork screw was no joke, and my sun dress would not protect me from any road rash. Chuck knew the crowd, and pointed out all the previous winners. He was really taking it seriously. He kept telling me I was going to win and I was trying to lower his expectations. He had no idea what my fitness was, and I had no idea what kind of cyclists I was surrounded by. The whole LG crew was there to watch the start. I'd practiced folding the bike maybe a total of 6 times. I thought I'd be pro, after all I used to be a triathlete, so I think I'm good at transition like things. It felt like the entire field had already left, when I finally got my bike assembled and started pedaling. I fell behind and didn't want to miss the front group. I was a little tired from mountain biking and planning to use my road bike strategy to make my life easy. By the hill on the first lap I'd settled into the top/middle group, where I was drafting off a few guys and felt good. Maybe I had a chance to place in this race. When I came around for the second lap I heard the announcer say the first girl just finished her first lap - I could see her about 200 yards in front of me. I got excited and wanted to go for it - but I remembered my bike racing strategy, and stalked her instead. I sat back the second lap, made some friends and sucked some wheels. I was trying to not let her know I was back there, but when we got to the top of the hill, my cheer squad totally blew my cover. I would have had it no other way. Third lap, I was bored, I didn't want to wait behind her anymore so I made my attack on the hill. I rode with her for a bit, chatted her up, then said "let's go catch the next group of guys!" I had a small gap, but it wasn't really until I was almost at the crest of the hill when James Cowan said "Go Katie, this is your chance! Drop her!" I stood up, and with a few strong pedal strokes she was history. The last 2 laps I was on the defense. I knew I was stronger than her, but I wasn't confident on the turns/downhills, so the race wasn't over. I played my cards right and recruited some Italian man to work with me. I dragged him up the hills, and I followed his line for the technical bits. By the fifth lap, we had lapped tons of business coats, ties and skirts. Once my new friend got me down the cork screw and hairpin turn I tried to tuck my exposed spandex back into the American flag shorts and took off - I was headed to my first (and only) national championship. Post race, everyone was at the finish line to celebrate with me. Brompton handed out lots of free beer tickets and gave us tacos, we let the beer wear off waiting for the podium, then sprinted to the dance party going on in expo to get all the bits of remaining energy out. Now, it's time to start training for the Brompton World Championship in July. Next year I'll make it to the aquarium. May is National Bike Month. In honor of this, Velo Club La Grange is proud to offer our first La Grange | Cycling Savvy Bike Safety Workshop. Join us for an evening of fun as we learn better ways to ride safely and confidently on LA's busy city streets. This FREE class is for young and old, racer or cruiser, experienced or novice and is open to all (members and non-members). We particularly invite our experienced racer friends. You are ambassadors of the sport and we want you setting the standard for cycling safety. – The 5 most common motorist-caused car-bike crashes and how to avoid them. – The most important means of communication between cyclists and motorists. – When bike lanes make sense to use, and when they are best avoided. 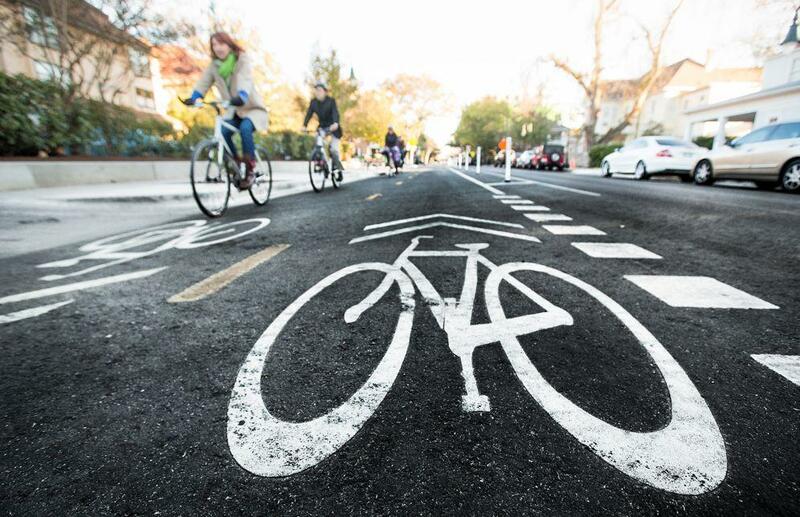 – Why lane control by cyclists is almost always both legal and safer than riding near the curb. – Options for group cyclists dealing with red lights and STOP signs that balance safety, cooperation, convenience and legality. Cycling is great for exercise, transportation, the environment and is just plain fun! Learn how to stay safe and enjoy your bike this summer. We'll have this up on the La Grange calendar soon but please save the date and plan on joining! La Grange Mountain Bike Team! The La Grange Mountain Bike Team is in full swing. With 10 club members racing the first 2 events, this is proving to be a fun way to play on a bike. And the podiums! It turns out LG is pretty strong in the dirt, with 2 wins and 4 podiums. If you’re curious about getting involved, reach out to Cari Smulyan for details on training rides and races. We’ll be racing Los Olivos Sunday May 6th - will you join? After a frustrating race experience at San Dimas, a week off the bike following and a good week of training leading up to this race, I was looking forward to pushing myself with my teammates. I had a hunch that if I could hang on through any surges on the flats, I would do well on the climb. With our power in numbers, we decided to take turns attacking on the flats for funsies to see who would chase. At one point, Dani and I locked eyes and she said something like, “you go, I’ll counter” which made me feel like a real racer because I know Dani makes moves like Mick Jagger. In hindsight, I wish I attacked for longer but now I have reason to race again. There were times when the pace picked up either from our attacks or others, and I felt myself falling off the back but I dug deep for a short amount of time to hang in. And I did. Start of the 1st climb: I found myself near Ellen, Tina as the group separated with Ellie and Dani just a bit behind us and Claire in front of us. I had 2 choices- stay back with Ellie and Dani or climb with Ellen and Tina. Hard choice when you like all your teammates, but I went with Ellen and Tina thinking that if I couldn’t hang I could always find my way to Ellie and Dani. My legs felt strong so I took a turn leading Ellen and Tina up the climb just in time to get a sweet turn-around picture. Ellen, Tina and I worked together to chase on the descent, picking up people along the way. More friends! The second flat out and back was pretty unremarkable, except for some leapfrog with a dropped men’s racer. 2nd and final climb: Tina took off to see if she can win the climb from the start. I was thinking to myself, shoot Tina why are you working so hard so early?, but trusted that she was making the right decision with the cards she had. I focused on the pack I was in, sitting in and conserving energy for the long climb to come. I wasn’t in a position to control the pace of the pack and I could tell these other racers wanted to go fast so I sat in the pack and made them work for me. Eventually we caught Tina, then Claire. From that point on, I noticed the breath of others around me getting louder and checked in with my own body- it felt good and breath was under control. Maybe I have a chance at something here? But only if I pick up the pace at the right time. Fort La Grange is in a middle school parking lot right? The yellow school sign seems like a good place to start an effort. I took off expecting someone to catch me before the finish because I’m a pretty terrible sprinter but I gave myself enough of a runway to hold it. Not sure how far ahead the lead rider was because I had my head down into the finish but I was happy with my 2nd place in the 4/5, 1st in the 4s. TL;DR- Consistent training does pay off. Holding back and letting others do the work can make all the difference. I wish I tried some longer attacks earlier in the race for experience-sake. Looking forward to whatever the next race brings. Vive La Grange! Some people wait all year for the music festival Coachella or Burning Man. For me, I wait for Bikechella aka Sea Otter Classic (SOC). Thousands of people from all over the world come to SOC every year and while racing is on the schedule it is just one of many experiences a person can choose to partake in over the weekend. SOC is about making memories, being part of a community, connecting with your inner child and trying new things. For Alexander Miller that meant going on his first mountain bike ride, for Patrick Barrett it translated to competing in the eMTB race and for Katie Rollins it meant riding a Brompton fold up bicycle for the first time, becoming a National Champion in the process. Supporting one another, bouncing from race to race, feeding off the energy of those around you, going outside your comfort zone, and laughing is what SOC means to me. Racing is wonderful and fun, but it cannot be taken too seriously. One of my favorite memories from the weekend was when there was a group of us watching Elijah, Ryan, Steven and Sam in their respected circuit races, and as Sam crested the top of the climb at the front of the pack he turned to the group and yelled “I winnie the race, I winnie the race” and it was said with pure joy and enthusiaium that you could not help but smile and laugh with him. If that isn’t what being part of a club or on a team or riding bike is all about then I do not know what is. Sam's plan: sit on the front and yell, "I'mma gonnna wiiiiiiin." At the top of the climb. Results: 1st place. Twice.